Professional Advocacy for Every Client. Since 1987, the attorneys at The Law Offices of Dean Koulouras have been committed to serving our clients by providing innovative and aggressive legal representation. We pride ourselves on providing high-quality legal services at a fair and reasonable cost. With more than 45 years of experience combined, our lawyers have a reputation for success in legal matters requiring high-powered trial skills, expert research and sophisticated strategies. We are known for our consistent work ethic and extraordinary attention to detail. At The Law Offices of Dean Koulouras, we provide every case with the same level of attention and care. We are always prepared to take each and every case to trial. 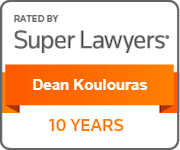 Whether you have a large and complex litigation matter, a small lawsuit, or a traffic charge, we at The Law Offices of Dean Koulouras have the reputation, experience and skills necessary to guide your case to a successful resolution. The Law Offices of Dean Koulouras is based in Livonia, Michigan and represents clients throughout the Metro Detroit area. If you have a question about a legal issue, contact us today!